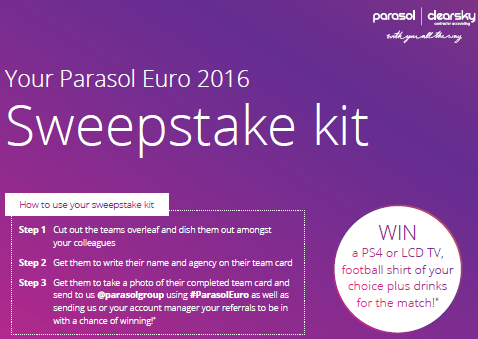 Download your Parasol Euro pack to get involved in our summer competition. We’ve taken care of everything so all you have to do is get the wall chart up in your office and start sharing the sweepstake teams with your colleagues. You could win a prize of either a PS4 or a TV along with a football shirt and drinks of your choice*. Simply pick a team from the sweepstake kit, write down your full name and agency on the ticket then send it back to us via your account manager or to our social media accounts. Stay tuned and follow us at @parasolgroup or on our LinkedIn page to keep up to date with all the latest #ParasolEuro activity. 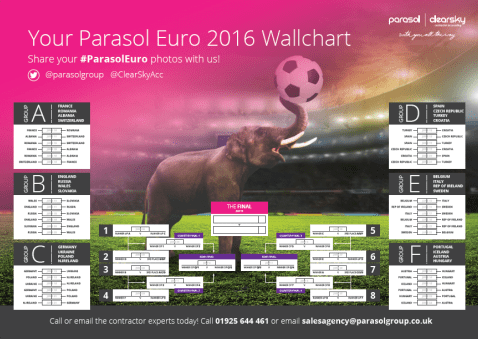 Simply download the wall chart and sweepstake kit from the images below. Alternatively you can also get in contact with your account manager and they’ll come and deliver your #ParasolEuro pack straight to your office. Get involved today for a chance to win! To refer a contractor, speak to your dedicated account manager or call us on 01925 644 461. Alternatively, simply fill in the short form below to start referring your contractors today. If you'd like to speak to our agency support team, call us or request a callback.